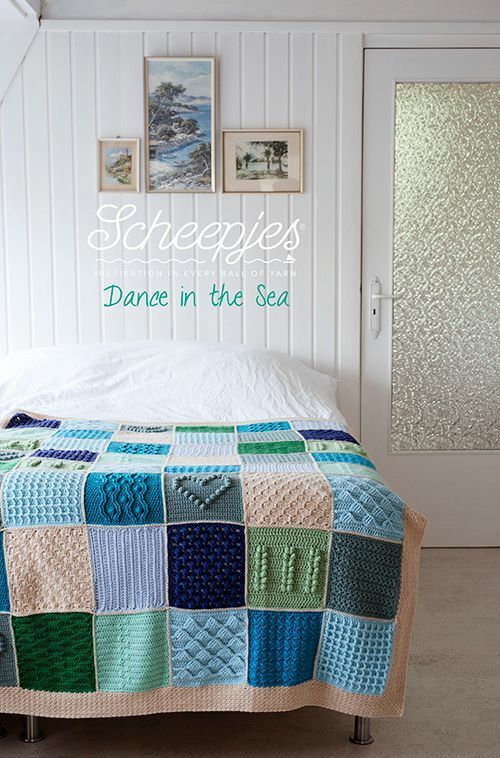 Last summer my friend 'Wink' (Marinke) was working on a new design for a CAL (crochet-along) in collaboration with Scheepjes - it was to follow on from the huge success of their 2014 CAL and had a working title of 'Dance on the Beach'. Tragically, Wink lost her battle with depression before the design was finished, leaving behind her notes, samples and mood-boards. After liaising closely with her family, Scheepjes decided to continue with the CAL in her memory. The CAL is free to join and starts on April 20th. It will last for fourteen weeks. Each individual square will be released in English and Dutch, in PDF format with full video support, on Wednesday afternoons, Dutch time. 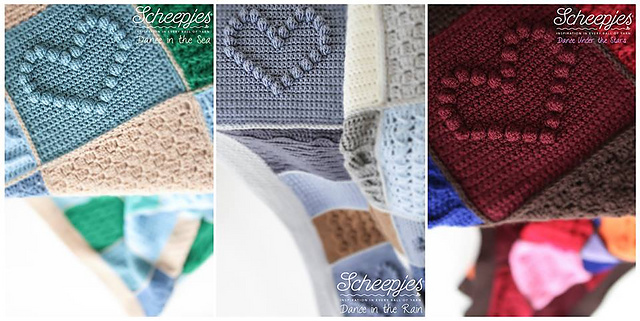 Scheepjes will be offering extra support for their customers in the form of International/ English language and Dutch groups on Facebook. The groups are already very busy with thousands of people joining in to honour Wink, I am sure she would be quite overwhelmed by the love and support people are showing. So that as many people as possible can afford to take part with the official kits, each colourway will be available in two different double knit yarn options. The Basic Kit will be £33.99 / €43,40 and is made up of 14 balls of Colour Crafter Acrylic yarn (which is super soft and doesn't feel as inexpensive as the price tag might suggest!) and a special edition label. The Luxe Kit comprises 39 balls of Merino Soft yarn (which as the name suggests, is incredibly soft and squidgy), a special edition label and wooden button, Knitpro stitch markers, a luxury embroidery scissors, colour catcher and Eucalan wool wash, and is packaged with a luxury beach bag. This option will cost £119.99 / €159,90. Both kits include a €2 charitable donation to Mind in Wink's name. If you would like to select your own colours or to use a different yarn (some people have asked about substituting cotton yarns or Stone Washed if they live in warmer countries) you can make a donation to Mind yourself, if you wish. You can already find the project listed on the Ravelry database so you can add it to your queue / favourites. 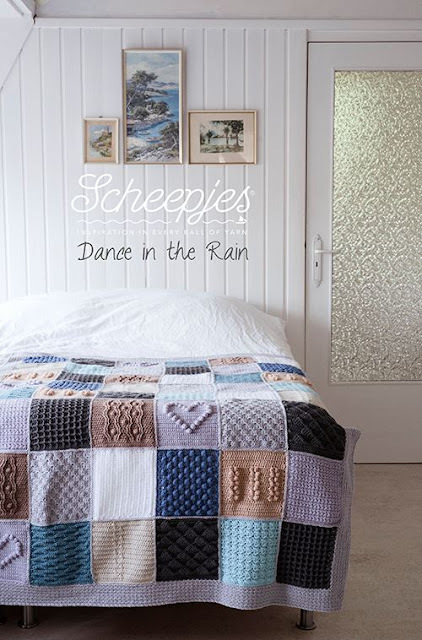 As soon as the kits are ready, I'll provide more information - for now I can tell you they will be available at Wool Warehouse and Deramores in the UK from 1st April, as well as from other Scheepjes international stockists. I heard from some of the group members that the UK stockists offer great shipping to more far flung participants in Australia, New Zealand etc but that early ordering is recommended. You have about a week to choose your favourite... I still don't know which is mine - what do you think? This is nice. I often think of Wink. That is beautiful, and what a lovely thing to do to remember your friend. It has been emotional to work on this project, and again as everyone sees it. I am glad that I could be a part of this, which is thanks to Wink herself introducing me to the lovely Scheepjes people and the other bloggers they work with. Im so glad Winks friends did this for her. I think the whole crochet community was in shock when she left us. Depression is an awful thing - and not really understood even now - this is such a wonderful way of raising awareness and a lovely tribute. I keep thinking I HAVE chosen a colourway and then I cant decide! I love the Autumn and the Sea. I want to get the Luxe kit so maybe I can do another in the Colour Crafter. Which IS a lovely yarn. I was originally going to use Cotton 8 but then I saw the scissors with the kit and that was it - grin. It's amazing how a scissors can change everything :D and really, cotton 8 is always available so you could always make another layer if you want. I've a feeling that these kits will be selling like the proverbial hot cakes! Hahahaha. I think a lot of people have ordered more than one kit for this reason. I was sorely tempted by Sea and Rain too - they are beautiful. Lovely! If you use Facebook, the International/English group has thousands of members already and there are even some meet-up events being discussed by different members around the world who have 'met' through the group. I think that this will really bring people together. It's really good.